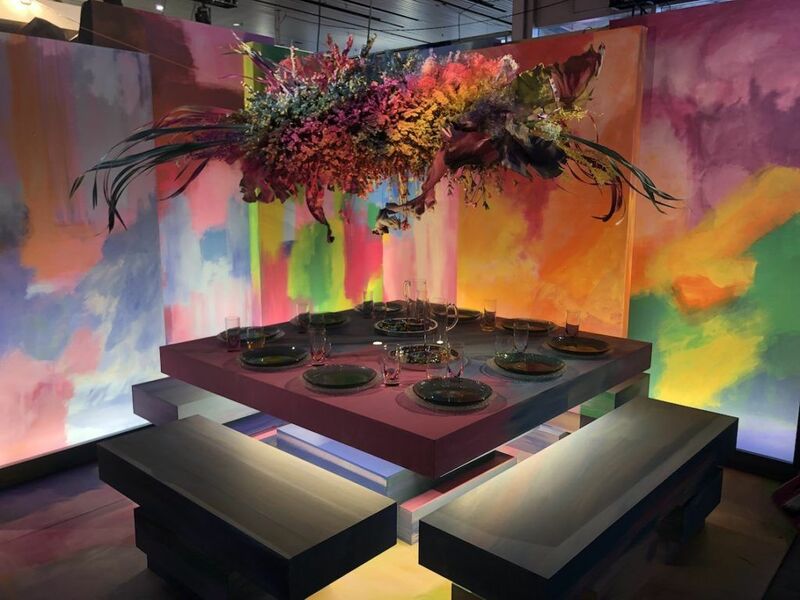 At the 2019 Dining by Design in New York, we found lots of ideas — from complex and over the top to simple but dramatic — for upping your dining table game. 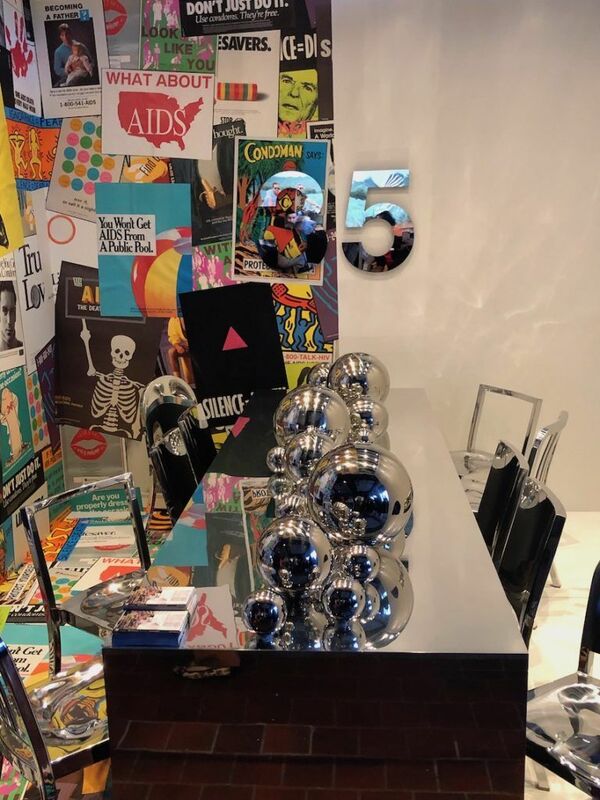 The displays are created by designers highlighting a particular theme, many associated with the evolution of the AIDS crisis. 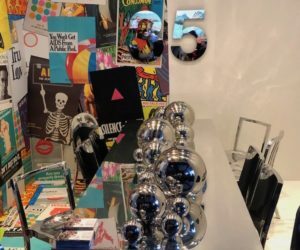 All the proceeds benefit Design Industries Foundation Fighting AIDS, better known as DIFFA. See which of these inspires you most. 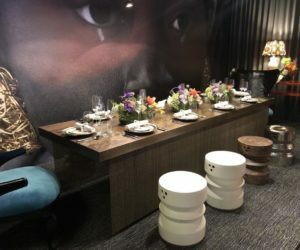 The focus of this design bu the Black Artists + Designers Guild is the image on the wall and the theme is meant to represent “the silent hope binding us together. If she is diminished the whole is compromised.” Turning to the table itself, a trio of more traditional flower arrangments line the center of the table. 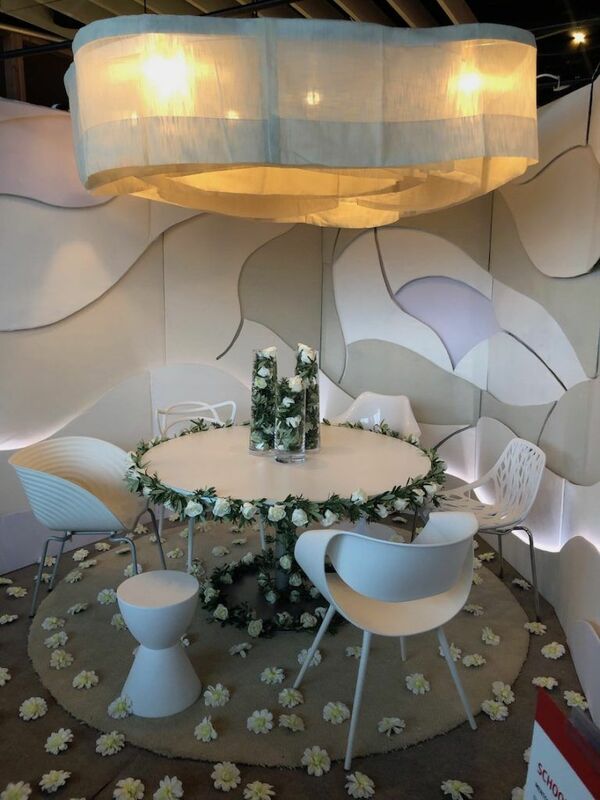 The feeling is kept fresh by featuring a varied array of more casual blooms and the seating is a mix of modern wing-back chairs at the ends and stools along the sides. Flowers can be inserted in vessels in different ways. 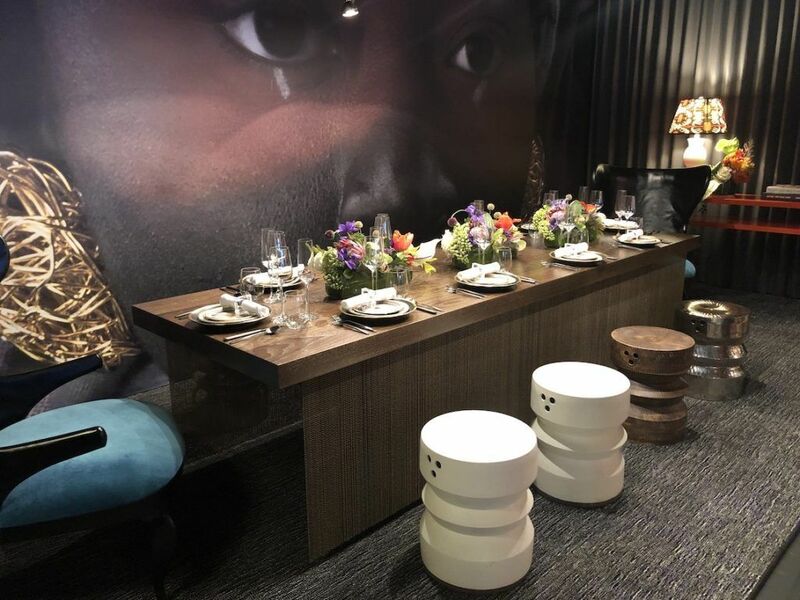 Try transporting your guests to an unexpected place at your next dinner party as David Scott Interiors and Roche Bobois have done in this space. It is meant to evoke a dinner aboard a luxury liner cruising the Atlantic. 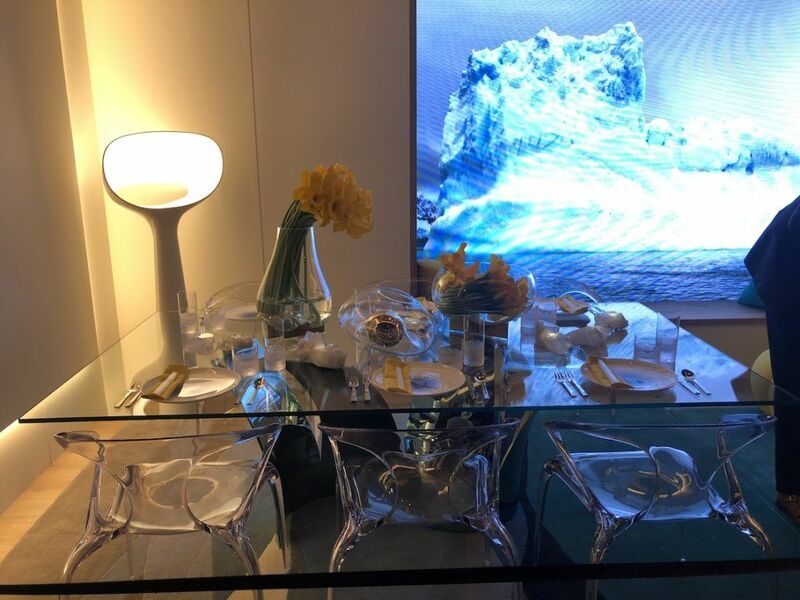 The screen images provide the mood and the predominantly glass table and settings reflect the blue ocean colors. 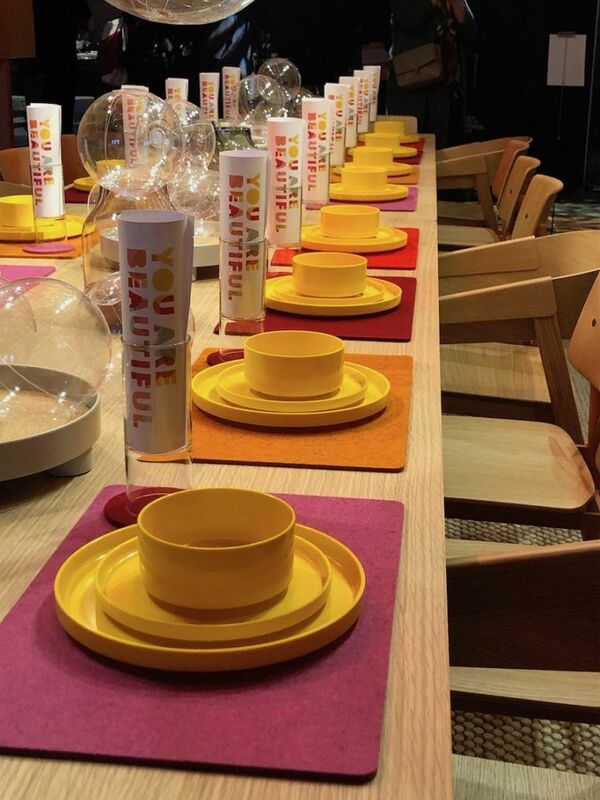 The flowers and other elements in the center of the table are meant to remind diners of the warm yellow sunshine. Note that the use of fresh flowers is casual and the stems are arranged to fit the vessels used. this is definitely something that can be repeated with all sorts of vases and containers. 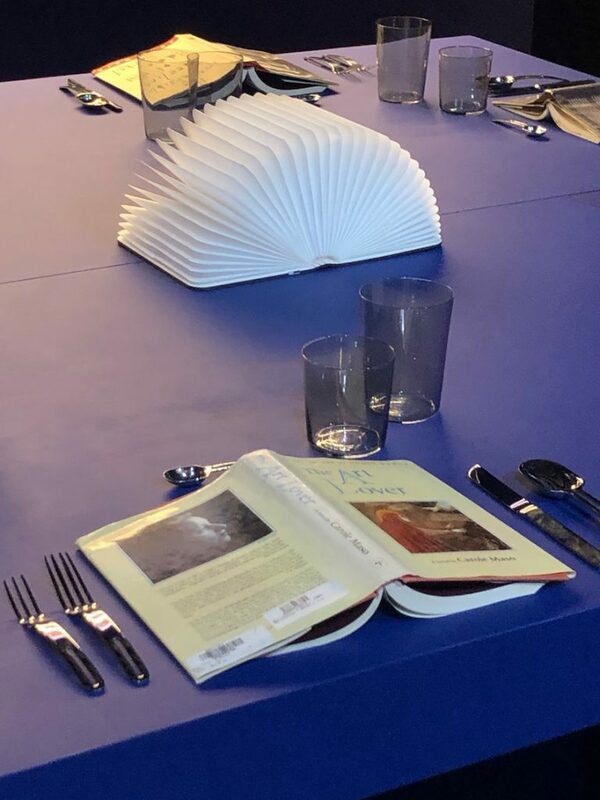 This table by Felderman Keatinge + Associates is called “No Dream Is Too High” and is meant to commemorate astronaut Buzz Aldrin and the 50th anniversary of the first lunar landing. 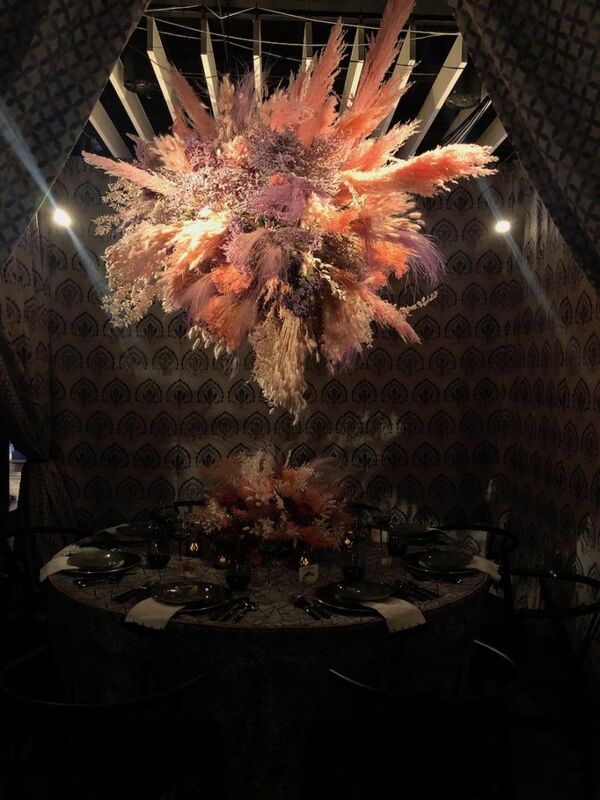 It’s a great example of how any anniversary can be used to drive the decor theme of a dinner table. Custom drawings are on the walls and the table itself sticks to a simple color palette. 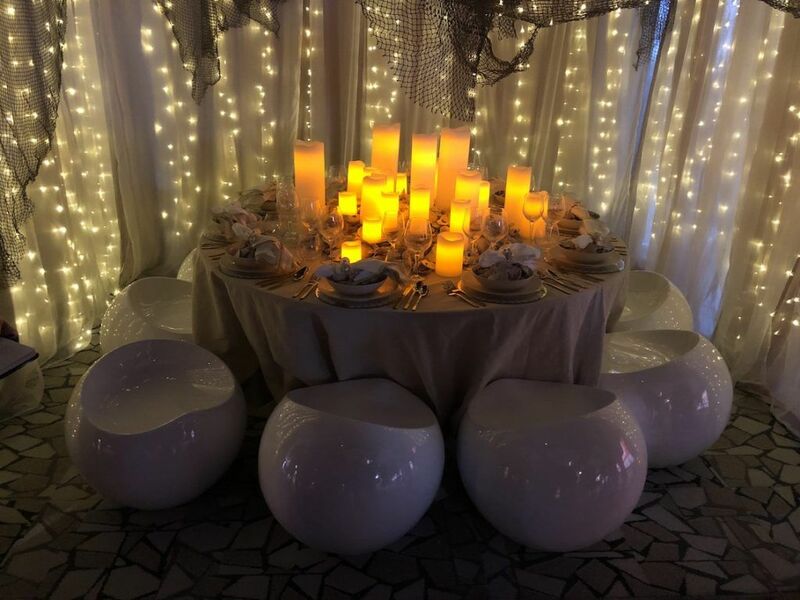 The napkins have a lunar-like abstract pattern and the centerpiece features glass rounds and simple sprays of silver balls. Herman Miller, Studios Architecture and WB Wood collaborated on this setting that they call “An obsessive examination of what makes dining experiences authentic.” They look at everything from the gaze/dining as voyeurism to experimenting with materials as tangible and emotional design elements and a study of the ideal table shape to foster communications. 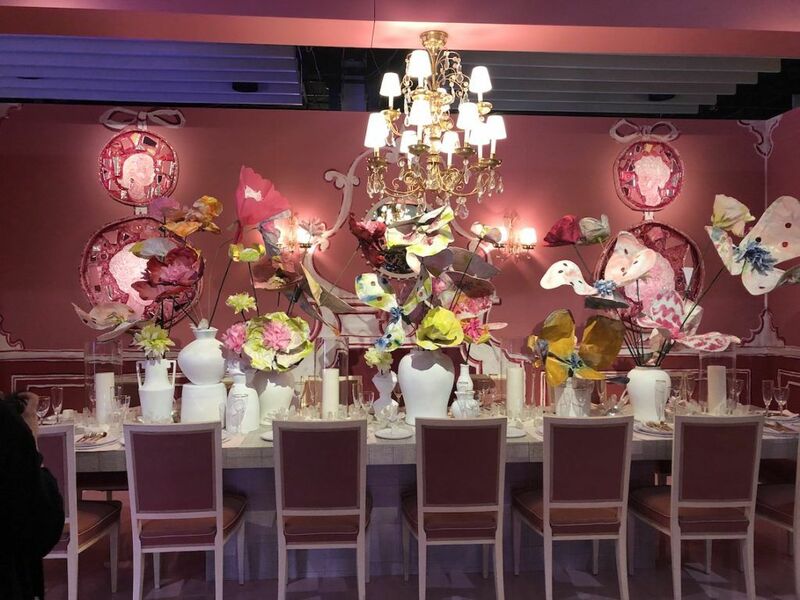 The free-flowing centerpiece is a combination of food and decorative objects as well as flowers. 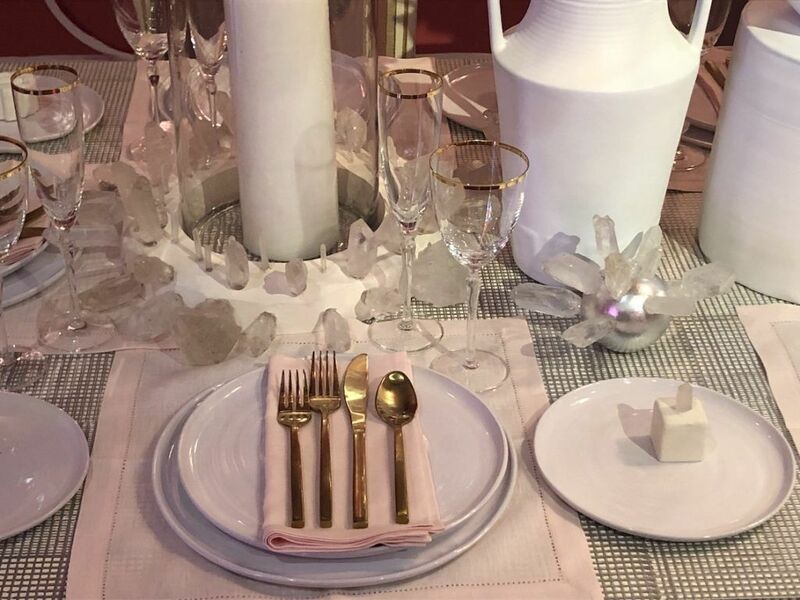 Study this tablescape and then let your imagination go wild for your next party. 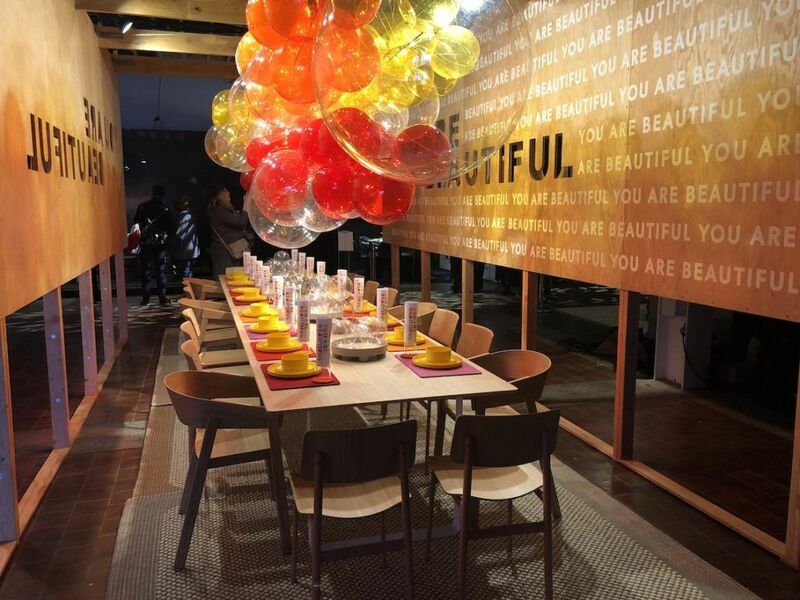 A single element can be used to create an entire environment as this dining space by the School of Visual Arts does. It was inspired by the flower itself and the individual elements within: The flower pistil represents hope, and the petals represent us — they are a unified entity that needs each individual. 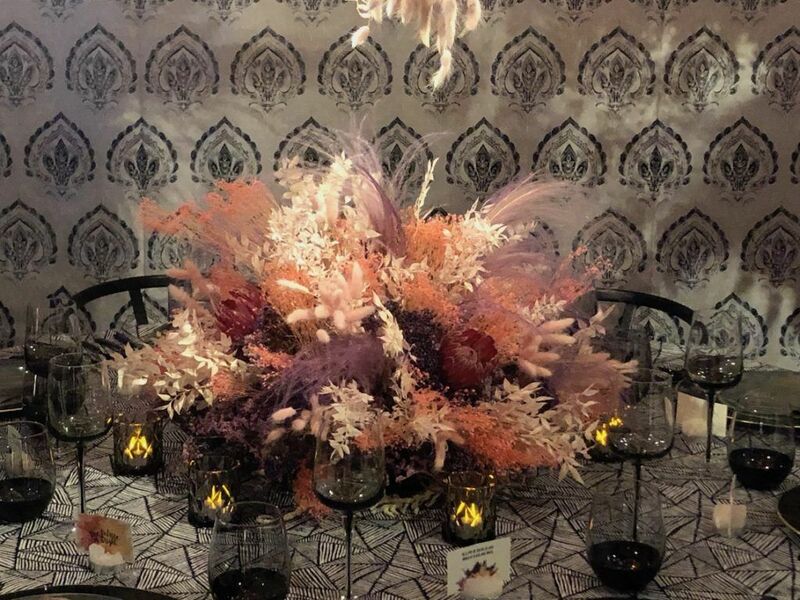 Using the same flower or decorative element in a simple centerpiece that is then repeated in different areas of the room ties the space together and puts the focus on the element, in this case, the flower. 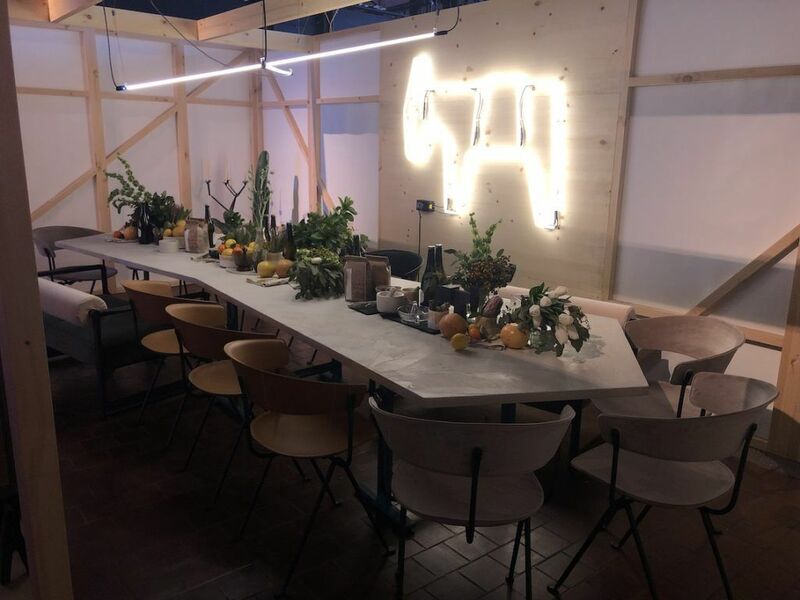 The dining space designed by IA Interior Architects called “Past + Present + Future” marks the 35 years since the discovery of the AIDS virus in 1984. The two sides of the room celebrate how far we have come and examine how much more there is to do. The use of a reflective surface on the table and the centerpiece elements reflects the stark difference of the decor on the walls. It’s yet another great example of how topics can be treated as a theme for a dinner. INC Architecture & Design used imperfect patches of color to create this playful atmosphere in their design called “Us is more.” The environment is made of simple forms and materials. the designers say that alone, they are rather unremarkable but together they are unforgettable. At this table, and life’s core, us is always more. Here the centerpiece is literally elevated to become a suspended element. 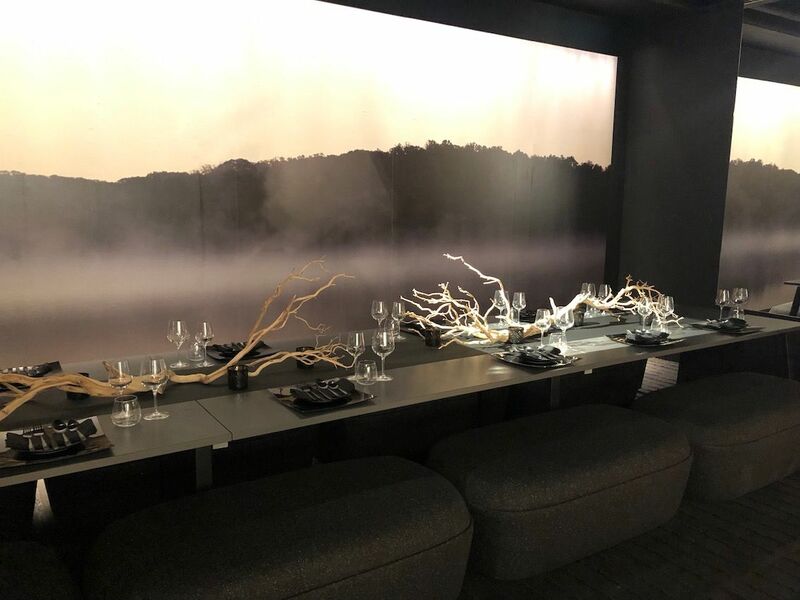 Not only does this create a more dramatic space, but it opens up the table and facilitates the connection between diners. 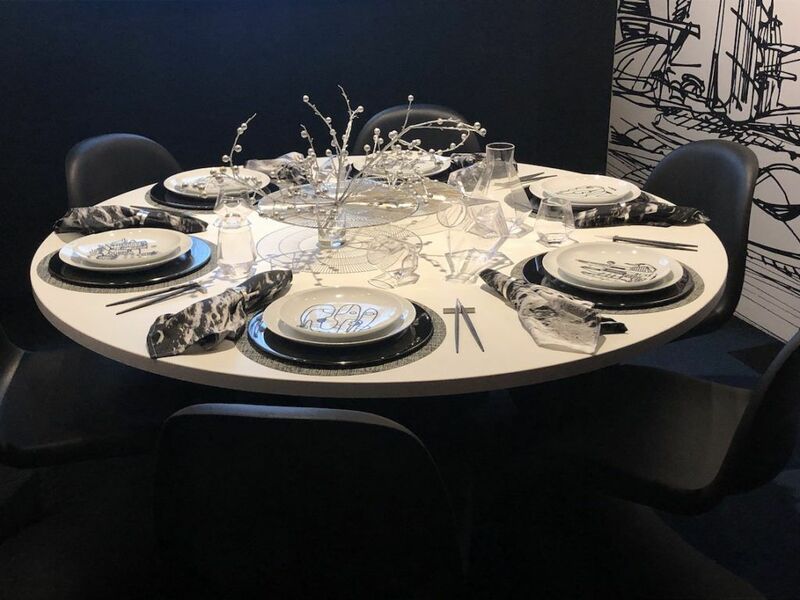 This monochrome dining space features Ultrafabrics designed by Stonehill Taylor. “Journey” highlights nearly four decades of research and human achievement in the fight against AIDS. 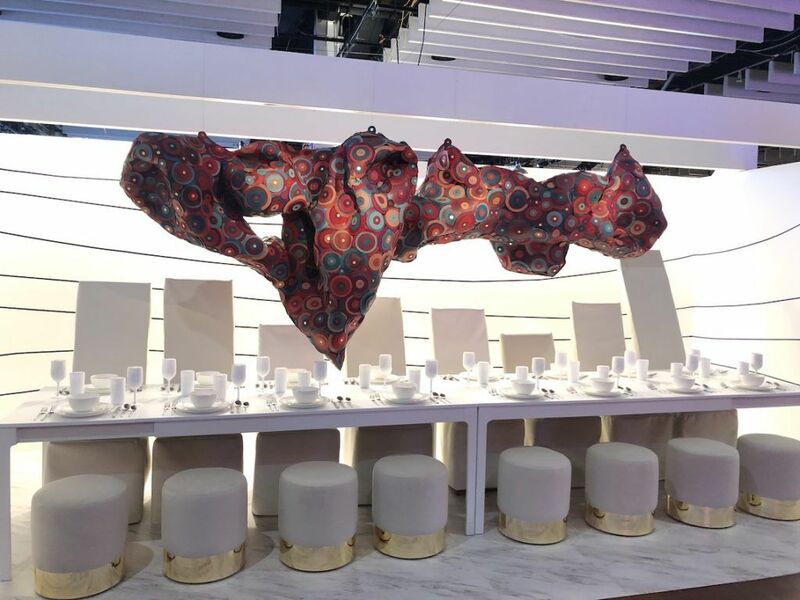 The hanging layered centerpiece is meant to represent hope and optimism thanks to ceaseless scientific and technological advancements. 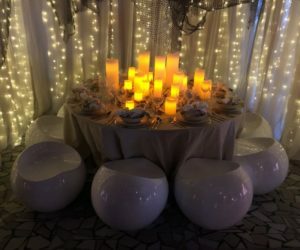 The setting is full of inspiration because of the all-white table settings that only serve to put the focus on the hanging element. Students at Pratt Institute designed their space called “Stronger Together” using the Japanese concept of kinstugi. This is a ceramic technique used to repair broken pottery with a gold or silver creating a more beautiful whole. 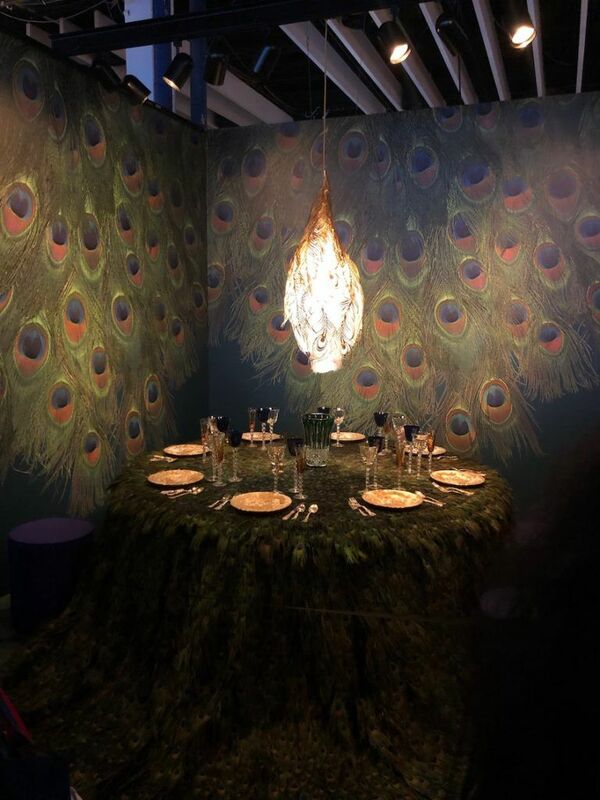 With the surrounding space being so dramatic, the table settings are appropriately minimalist, and the irregular color division of the table echoes the gold seam across the walls. 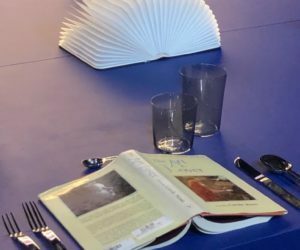 Every year, Homedit finds lots of ideas, techniques and concepts to inspire a year full of creative dinner tablescapes. From simple to complex, there are ideas for every comfort level. Pick a couple and try them out! The post Turn Your Next Dinner Party into a Dining Experience with Creative Centerpiece Ideas appeared first on Home Decorating Trends – Homedit.